The best-kept hotels in town. Sustainable hygiene management is now standard practice in the hotel and restaurant business. It promotes the well-being of guests and reflects the hotel's self-image. In addition, professional maintenance extends the service life of the facilities. Cost-conscious managers invest in Kärcher cleaning systems because they are economical in use, intuitive in operation and extraordinarily long-lasting. The first impression counts. This is especially true in the hotel and restaurant business. Cleanliness is the first impression guests have of a hotel. Leading hotels and service providers rely on the world market leader Kärcher for this. 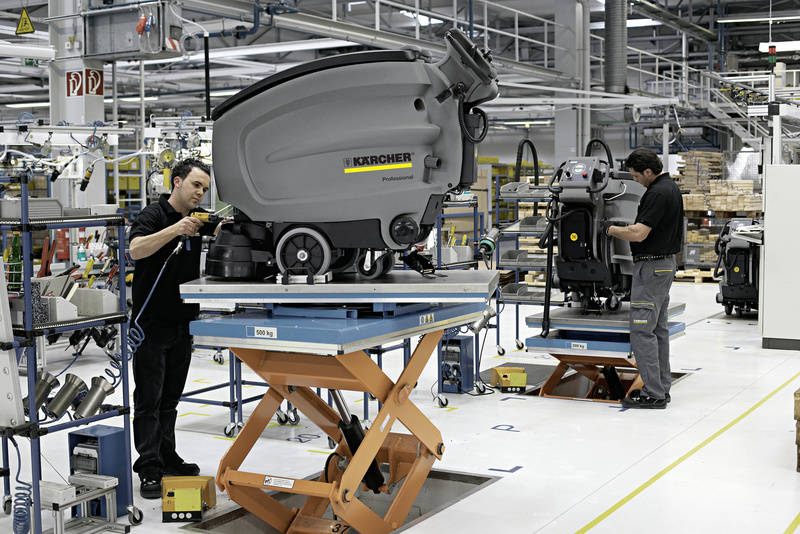 From scrubber driers for the foyer to incredibly quiet vacuums for the lobby, Kärcher always has the right cleaning system. The KM 35/5 battery-operated micro sweeper or EB 30/1 Adv Li-Ion battery broom are ideal for cleaning entrances and reception areas. They quickly, quietly and easily pick up loose dirt from hard floors and carpets, are readily available when you need them and can be set aside inconspicuously just as easily. Scrubber driers make floors hygienically clean and give them a brilliant shine. With its high contact pressure, roller brush technology is advantageous for textured or jointed surfaces. Machines with tried-and-tested disc engineering are suitable for smooth surfaces. Thanks to an optimised flow system, the T 12/1 eco!efficiency offers the same excellent cleaning performance as the T 12/1 basic version – but with up to 40% lower power consumption. It is also 5 dB(A) quieter. Kärcher polishing machines, such as the BDP 43/450 C Adv, generate high torque to produce an especially high-gloss surface. The polishing dust vacuum makes the work pleasant and prevents airborne dust formation. This technology also scores top marks for wear and servicing. Ideal for heavily soiled carpets: spray extraction cleaners loosen and remove dirt in a single operation. The spray-extraction function of the Puzzi series is ideal for heavy traffic areas which must be quickly restored to dry, accessible condition. Guests come first. And guests want things clean and quiet – in all areas, at all times. Cleaning systems for indoor areas must therefore have special characteristics: they must be quiet, easy to transport, ergonomically designed, and usable even in small spaces. These characteristics also make these machines easier to use and more pleasant for the operator. Upright brush-type vacuum cleaners like the CV 38/2 combine suction volume with the power of an electrically driven brush. This has the effect of raising the pile to allow the vacuum cleaner to remove dirt particles deep in the pile. The indicator light shows the operator when the roller brush setting should be changed to obtain the best cleaning results. Because less is more - everything is at it should be. With the T 12/1 eco!efficiency, the dirt does not go in the bag, but directly into a robust container. It features a versatile and highly efficient filter system. After all, cleanliness matters, but so too does hygiene. And the antistatic Irgastat bend ensures full suction power for effortless vacuuming. The vacuum cleaner for all surfaces – the CV 60/2 is a true all-rounder, as it automatically adjusts itself to every floor covering. From hard floors to carpets and vice versa – switching accessories is not necessary. Ease of use and extreme manoeuvrability. With contra-rotating roller brushes, side brushes, suction pipe and optional HEPA filter. The on-board practical accessory kit for cleaning hard-to-reach areas as well as other accessories and charger are ready to hand at all times. This telescopic manual suction pipe reaches the places the brush can't reach. Overhead cleaning is made easy thanks to the flexible suction hose. Automatic carpet cleaners in the BRC series combine spray extraction with the mechanical action of roller brushes. They are ideal for wet interim cleaning and basic cleaning of large areas. Puzzi spray extraction cleaners excel in upholstery cleaning with unbeatable extraction performance for extremely short drying times. The SG 4/4 steam cleaner removes stubborn limescale and dirt in bathrooms without the use of cleaning agents. Smart solutions that never fail to impress: the 2-tank system eliminates waiting times for heating the water. The VapoHydro function allows the spray to be adjusted continuously from steam to hot water. With its ergonomic strap system, the BV 5/1 rucksack vacuum can be carried comfortably on the operator's back – ideal for cleaning staircases or between narrow rows of seats. Also available as a battery-operated vacuum for even greater flexibility. Cleanliness and hygiene have top priority in swimming pools and saunas. Without compromise. Kärcher cleaning systems are ideal for cleaning in the wellness sector: remove coarse and fine dirt, dissolve limescale and disinfect. Areas are left looking clean and hygienic. The compact BR 30/4 C scrubber drier is the first choice for maintaining floor hygiene in sensitive areas, such as barefoot areas. You can spray, brush and vacuum in a single procedure or separately. Lightning fast and spotless. The BR 40/10 C scrubber drier combines a wide range of features: it scrubs like a single disc machine, vacuums water like a wet vacuum cleaner and polishes like a high-speed machine. Thanks to the positioning of its two squeegees, it can vacuum extremely close to the edge. In addition, the suction lips vacuum the water in both directions of travel – forwards and backwards. The SG 4/4 steam cleaner ensures impeccable hygiene in saunas without the use of cleaning agents: beneficial for both people and the environment. The all-rounder for mobile use. The AP 100/50 M is a simple and versatile all-in-one solution - suitable for different surfaces. The cleaning solution can be sprayed on and vacuumed. Body fluid lost in perspiration needs to be replaced quickly, preferably with pure water. And preferably right on site. The Kärcher WPD 100 water dispenser provides a constant supply of cold or hot, still or sparkling water of the purest quality. Surface cleaners such as the FR 30 ME deliver 10 times the area performance – indispensable efficiency for cleaning large wellness areas hygienically. The NT 70/2 wet and dry vacuum cleaner quickly removes water from floors to avoid a slipping hazard and effectively removes dirt. This high suction power also removes coarse dirt. The Kärcher Inno-Foam kit is a foam system for cleaning and disinfection with a high-pressure cleaner. The disinfecting foam has an especially long adhesion time, which enhances its effectiveness. The dual jet pipe is remarkably easy to use, changing between the foam nozzle and the high-pressure nozzle with a flick of the wrist. The kitchen is vitally important for the reputation of a restaurant. For compliance reasons as well, there must be no room for doubt that hygiene is the top priority here. The Kärcher system offers all the machines, accessories and cleaning agents necessary to maintain stainless steel surfaces, ovens and floors in appetisingly clean condition. The BR 30/4 C Bp cleans up minor spillages in no time. With cordless power instead of an annoying tangle of cable. No risk of tripping or getting caught. Nevertheless, this scrubber drier has enough endurance for thorough cleaning. The HD 7/10 CX F high-pressure cleaner is specifically designed for commercial kitchens. It has a food-grade high-pressure hose and abrasion-resistant grey wheels that leave no tracks. Together with the FR 30 ME surface cleaner, it is indispensable in a top-ranking restaurant. The NT 65/2 Ap is a high-performance, twin motor wet and dry vacuum cleaner for professional use. The flat pleated filter is efficiently cleaned by blasts of air for virtually constant suction power. The BRS 40/1000 C scrubber is an all-round machine for all hard surfaces. Thanks to its extremely low-profile construction style, it can also reach under shelves – an important factor for kitchen hygiene. It takes the concentrated force of a hot water jet or steam jet to remove stubborn baked-on dirt. Tackle the job with Kärcher accessories for steam cleaners, including the detail nozzle, brushes with brass bristles, and a cleaning cloth kit. Outdoor facilities – your calling card at the entrance. The anticipatory pleasure of a good meal or a wellness weekend reaches its climax immediately before the entrance. This expectation can be further enhanced by a well maintained outside area. This advantage should be exploited to the full – in the car park, along the driveway, and in the underground car park, walkways and pool area. And with the Kärcher system you can do all this using our perfectly coordinated machines, accessories and cleaning agents. The Kärcher KM 90/60 R is a compact ride-on sweeper that combines a high level of operating comfort with high area performance and effective automatic filter cleaning. The adjustable seat position, tilting steering wheel and oversized wheels underline its aim to fulfil contemporary expectations for ease of use. The compact and extremely manoeuvrable KM 75/40 W thoroughly cleans small to medium-sized areas effortlessly. The traction drive replaces physical strength, while powerful dust suction ensures cleanliness without dust clouds. Available with a choice of powerful petrol engine or whisper-quiet battery version for indoor use – with optional antistatic carpet sweeper set. The FR 30 surface cleaner masterfully transforms the power of a Kärcher high-pressure cleaner into area performance. The version with plastic casing is extremely easy to use, both outdoors and indoors. Multistorey car parks often place high demands on scrubber driers: large areas, coarse and stubborn dirt and steep ramps. The B 250 R is the right machine for this job: with robust steel frame for heavy-duty use on areas with inclines up to 15%. With large water tank and powerful battery for long work intervals. The innovative KM 35/5 C electric broom is a fast, effective and comfortable alternative to conventional sweeping. Thanks to the cleverly placed roller brush, it delivers impressive performance right up to the edge. A powerful lithium-ion battery eliminates the need for an annoying cord. The foot-operated power switch is especially convenient.